This shop is like a two-headed coin—you win no matter what. 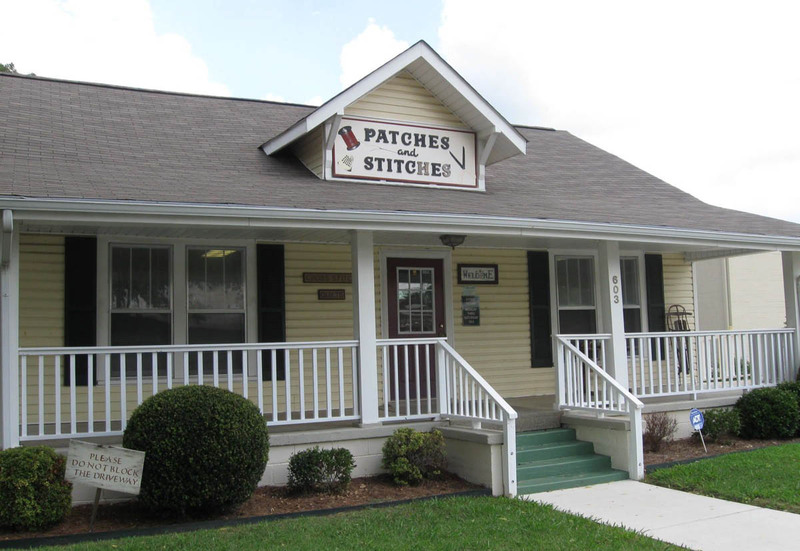 Patches and Stitches, located in Huntsville, Alabama, is both a quilt shop and a needlework shop. If you enter the front door from the street, you walk into the needlepoint and stitchery area. The needle point and stitchery entrance of Patches and Stitches. If you take the driveway to the parking area in the back, you'll enter into the quilting and fabric area. 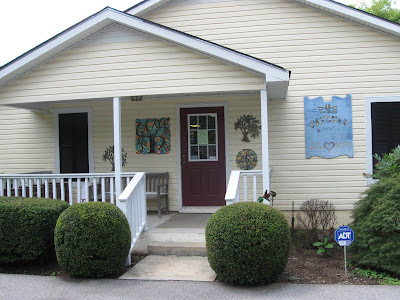 The quilt shop entrance of Patches and Stitches. Walking through the back door leads you into the main room which has a centralized cutting table surrounded by fabrics, books, quilting gadgets of all kinds, notions and patterns. 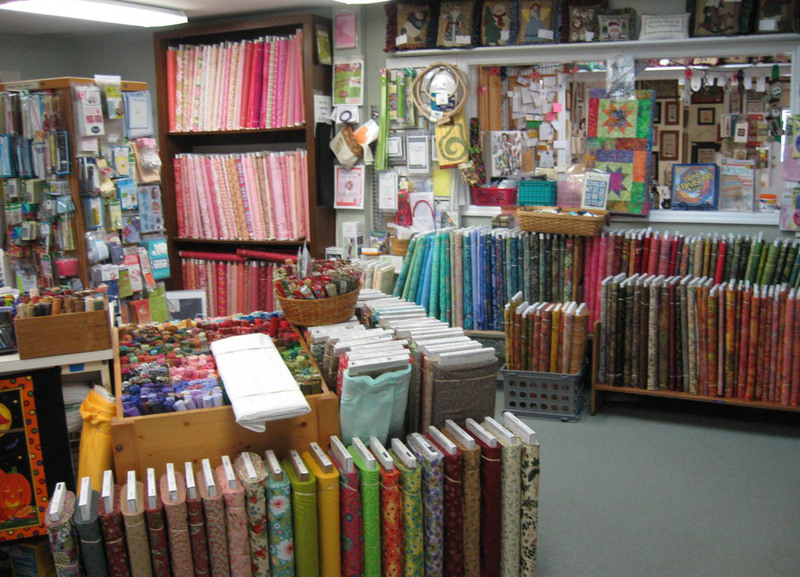 Quilting fabrics, notions, books and pre-cut fat quarters are located in the larger room. 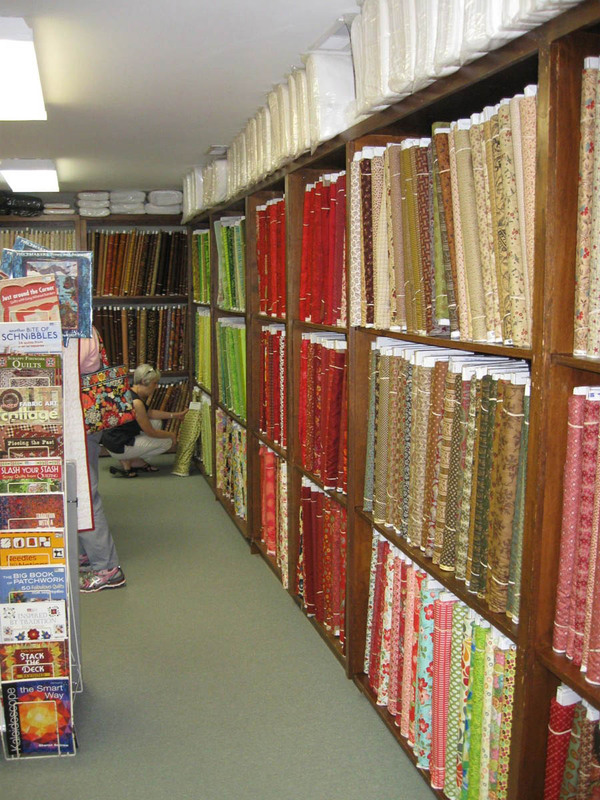 The extensive selection of fabrics is grouped by color and theme. Quilting cottons in the shop are arranged by color. 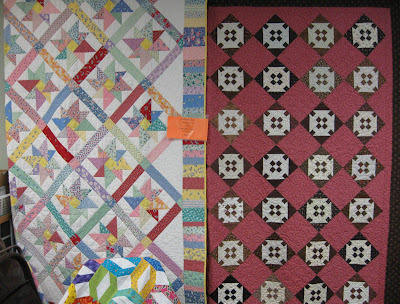 Off the main room is the classroom with ceiling-to-floor quilts and class projects hung on the walls. 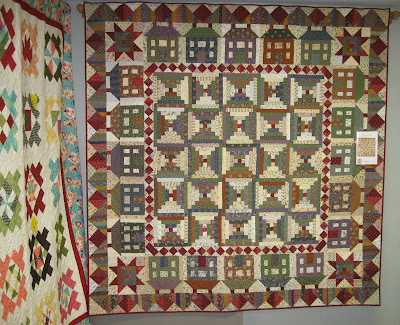 These quilts are exquisitely pieced and quilted. Class samples haningg in the classroom. 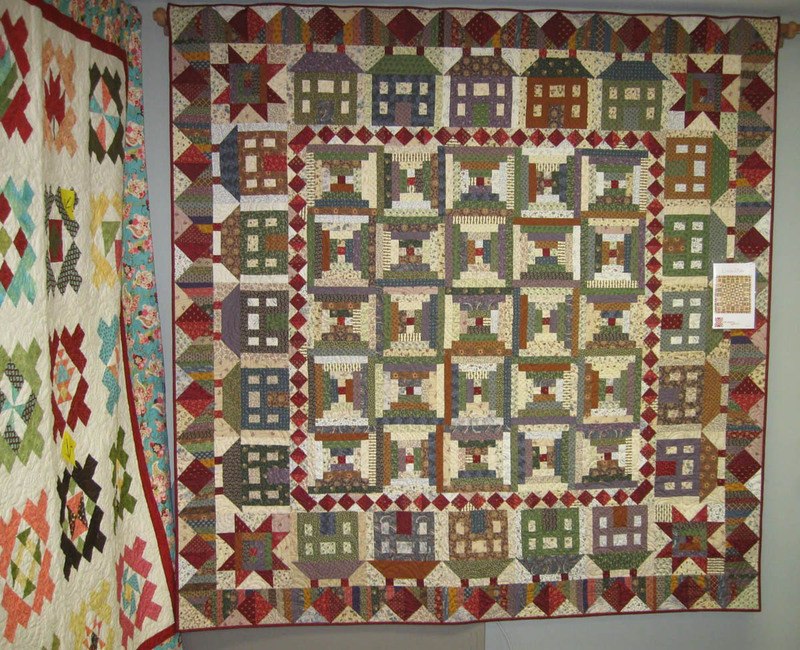 The quilts in the classroom are colorful, classic and beautifully made. 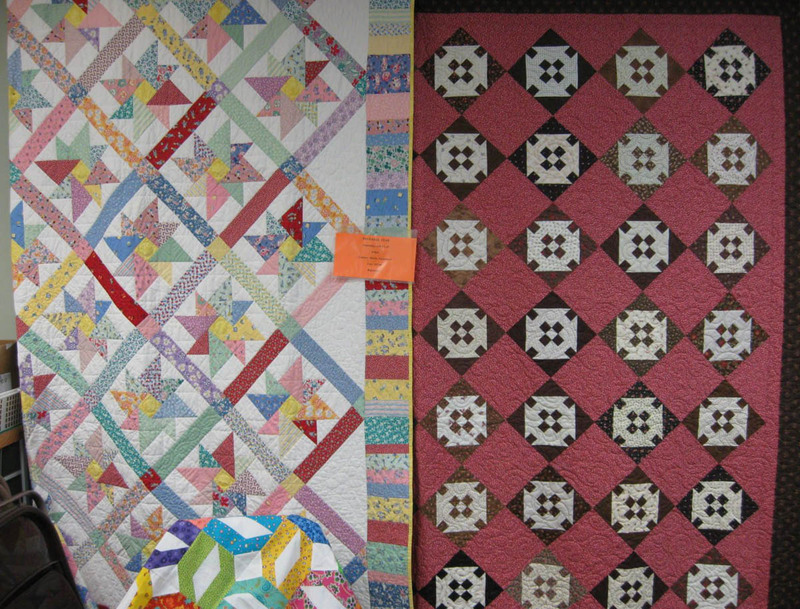 Quilts and class projects are displayed in the large classroom. 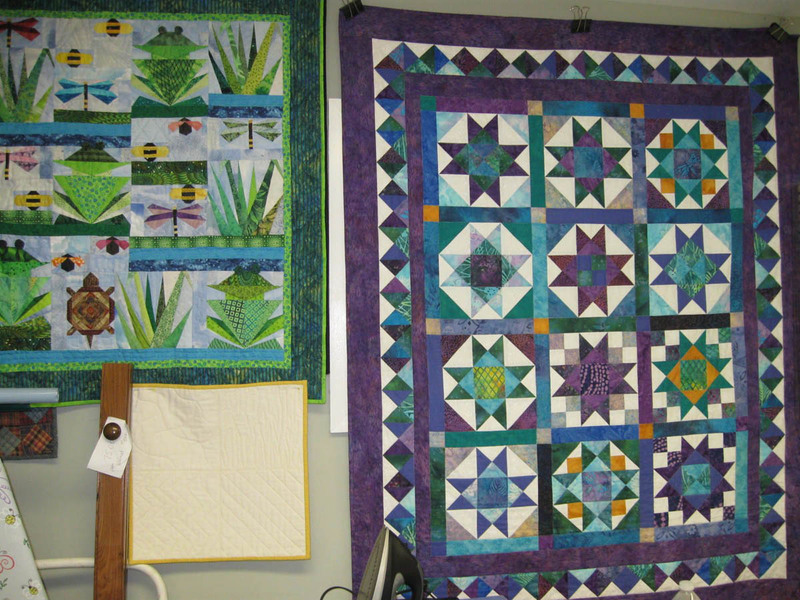 Classes are offered for quilters of all levels: for beginners to learn the basics and more skilled quilters that want a challenge of more complex or advanced techniques. 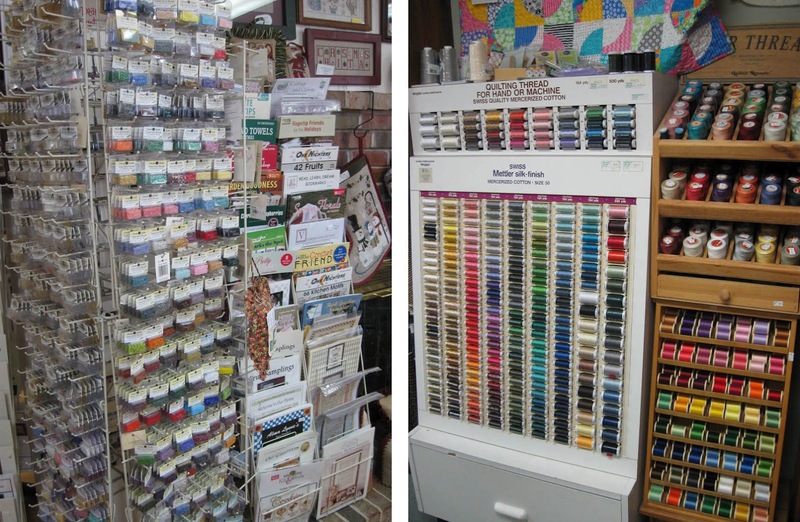 Patches and Stitches also has a very good selection of pre-cuts, Fabrication strips and fat quarters for fast and fun projects or to beef up your stash. 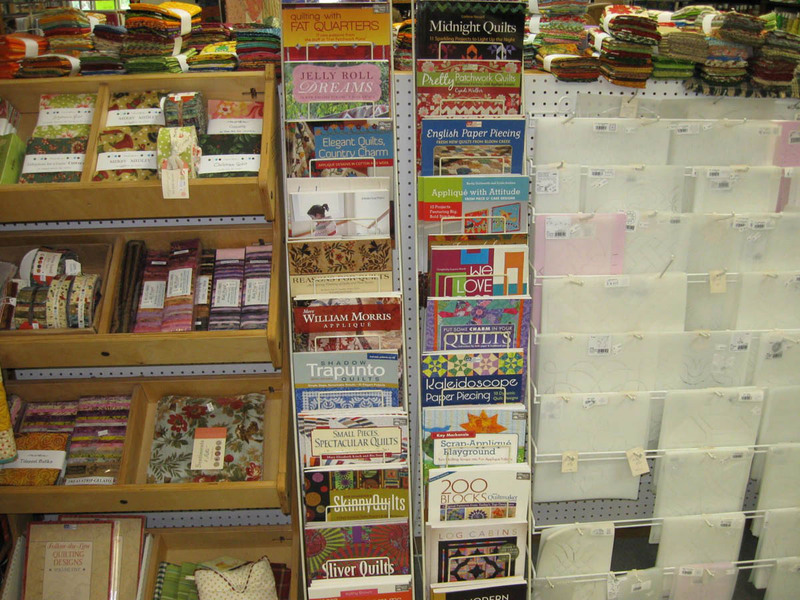 The selection of books and patterns provide inspiration as well as instruction for using these fabric goodies. It was also nice to find a selection of quilting stencils at the shop. 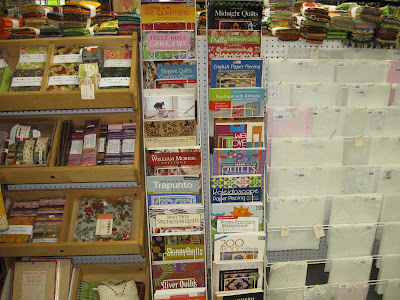 Precut fabric bundles, a selection of quilting books and quilting stencils. 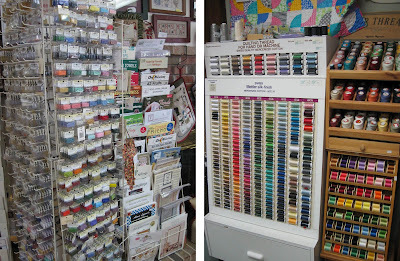 If you have multiple fiber addictions (quilting as well as needlepoint and stitchery), you'll revel in this room with its fabulous assortment of threads for hand stitching, needlepoint, hand embroidery and canvas work. 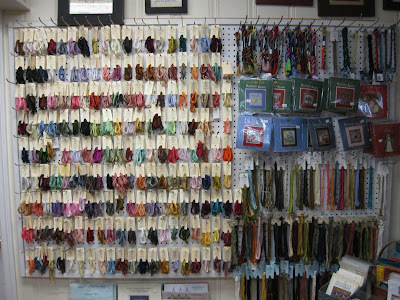 Threads and yarns for hand stitching and needlework. 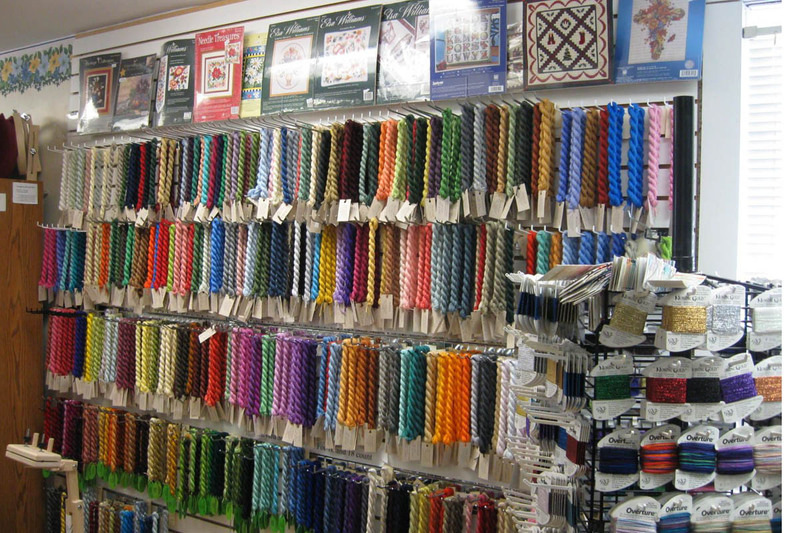 Quilting and sewing theads, along with beads are also available. More threads and yarns and kits for hand stitching. 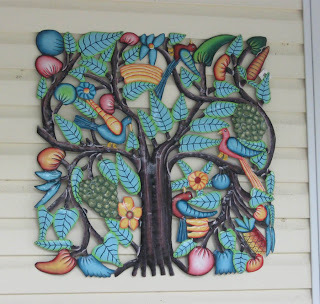 This metalwork art piece hangs outside at the back door. It's a perfect preview in color and artistry of what you'll find inside. 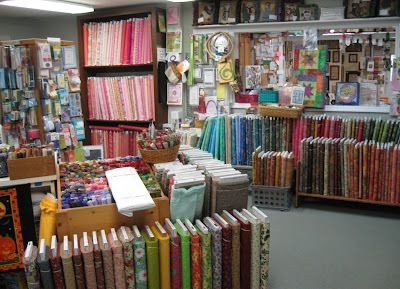 So stop by, take it all in, and be sure to take some "quilting goodness" home with you! 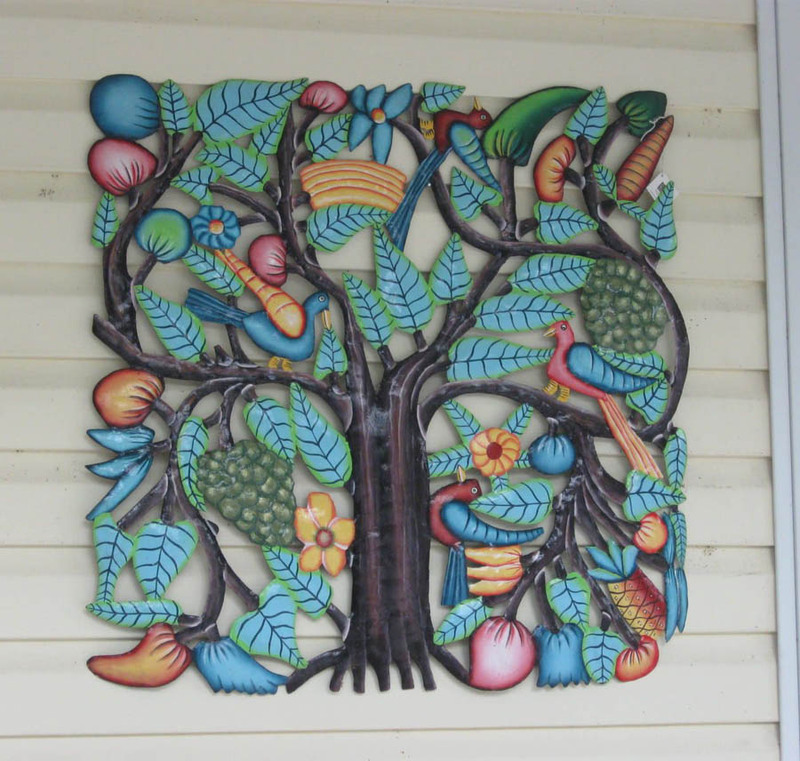 Metalwork art hangs beside the doorway. I would like to be in your quilt e needlework shop, but I am so far from you! !